Yep, you read that title right. I ran my first 10k today! You might remember the post I made about a month ago about the freezing cold race that I ran on February 15th, The Ice Cube 5k. The Muddogs Race is the third and final race in the Winter Warriors series. These winter races definitely fit their names… the first was The Snowman’s Race and it happened during a massive snowstorm. The Ice Cube was icy, and the highest temperature was 5 degrees while I was running. And The Muddogs was muddy, slushy, icy, and just slightly warmer at about 25 degrees. I had debated whether or not I was going to do the 10k or the 5k for this race. I still haven’t gotten my fitness back to where it was – where I could run a 5k distance without stopping to walk. My friend that also ran the Ice Cube with me posted on Facebook that she had signed up for the 10k… she asked, “Are you going to do it too? ?” I had done a few longer training runs, 5-6 miles, but had only done them as run/walk workouts. I knew I wouldn’t be able to run the whole race, since I haven’t even run a whole 5k in almost a year. I decided if I could manage a 6.2 mile run in a decent time at the gym without feeling like I was going to die, I would sign up. And I did… so I signed up. Somewhere between mile 3 and 4 my iPod died. I really think I should just stop taking my iPod because every time I run outside, it dies! I think it is probably because of the cold or something… but it sure is annoying to have that thing on my arm when I can’t even listen to it! I saw my other friend that was running the 10k around mile 4 and waved to her. 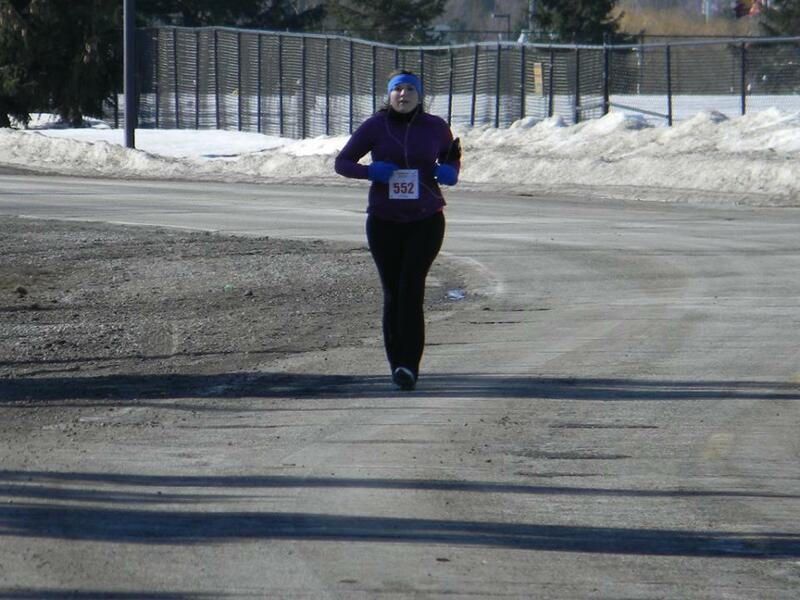 This part of the race was out on a dirt road with some hills and it was challenging, especially in the wind. My pace kept getting slower – mile 4 took me to 13:06. When I heard my pace for that mile, I said outloud “Oh no, I need to pick it up or I’m not going to make my goal!” (Which was to finish in under 1h:20m.) So I picked up my pace when I ran and started doing shorter bursts of faster runs with faster walks in between. My pace for mile 5 was 11:55, total time 1h:01m, just about a 12:00 pace overall. I had tears brimming when I crossed the finish line. I smiled a great big smile as Ryan, the race director, handed my medal and said “Great job!” I’m not fast, and I probably finished last for the 10k race, but I FINISHED. And I thought, wow, if I can meet my goal running/walking, imagine what I will do when I am able to run the whole thing.